Yeah yeah, we know Doom runs on everything from calculators to ATMs, but that’s Doom. 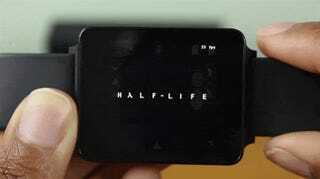 There’s something about seeing Half-Life running somewhere crazy—like some guy’s watch—that makes it more impressive. Using the SDLash app, you can boot and play Half-Life (or, I guess, any older game using the Source engine) on an Android Wear watch. While it’s far from perfect—the game is hard to control and crashes—that doesn’t change the fact you can play Half-Life from your watch. Note that this is an original LG G Watch; bigger Wear devices, at least those with square screens, might make things a little easier.